Rambling Moose: Redneck Redecoration and The Dog. In 1979, Mom bought her dream house. "It's a Buckstone!" she gushed. A Buckstone is a two story, four bedroom house. It was on a big corner lot in Barclay Farms, Cherry Hill, New Jersey. Quite a nice neighborhood. It was set back with a long driveway, lined with railroad ties, flowers, and shrubs. She loved that house, and I enjoyed that it was in the family. There were some things left behind by the prior owners, there always were. Some random Princess Phones, the pieces to a shuffleboard court that was in the basement, and this rug. We did play shuffleboard once or twice, but the charm wasn't really there. The rug was in the dining room, and it was truly a beautiful one. At the beginning of our ownership of the big house on the corner of the block, the rug sat under the dining room table. Thick and rich pile felt great under bare feet, and it watched the changes in our lives as the years slid past. The addition of my nephew to the family, the dog, my moving out, then back, then out again. Normal family lives of a Wonder Year generation. My childhood dog, Buck, finally passed away. He sat by the door that lead into the house from the garage that day waiting for my return. I was delayed a day, and he passed waiting. Buck gone, eventually Mom felt that she wanted another dog in the house. She got a yapper. Bo. Bo was a Maltese. Pure white and completely untrained. It got into everything, and was never fully housebroken. Hence the reason why that rug was on my back porch. While Bo was watering every piece of furniture in the house, Mom lived with it. Bo wasn't a long lived dog, he had diabetes and went blind toward the end. The rug got cleaned professionally but there was still a rust stain and it got rolled up and moved out when the house got sold and passed out of the family. It ended up placed in my Cedar Chest that moved with us from Philadelphia to Florida when we came in 2006. There it sat. For the next 8 years. Taking up space with my needing to do "Something" with it. Finally, I got a wild hair. I would "see what is going on with that rug"! Maybe I could use it again? I could keep it on the side of the bed in the bedroom that Rack doesn't get to! The road to the back porch is paved with good intentions. I pulled all the other things out of the old cedar chest that got crammed in there over the years. Mostly things for visitors that I wanted to keep clean. 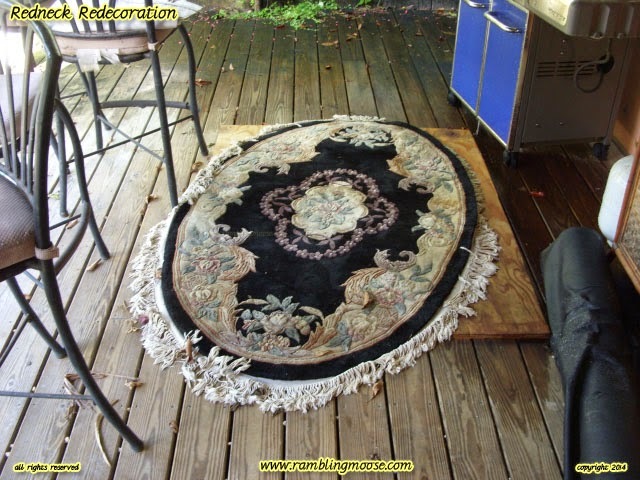 Spare pillow, sheets, a blanket were all rolled up and folded tightly to allow this rug the space it needed. The rug finally came out. I then remembered why it never got used. I put the rug on the floor and ran my toes through it thinking if I could put it out back in the sun, perhaps whatever leftovers were there might air out. After a day of sitting out in the hot Florida sun on the rare 90 degree full sun day we got before two weeks of storms, it didn't air out. It brewed. I turned the hose on it, got out the scrub brush from the bathroom, used a mild soap on it. Even some of that spray I used on the Jeep to make it not smell like the 12 year old car that it is. It sat outside another day to dry off. Dragging it into my Florida room, it sat behind the desk. Two days later Kevin asked "What is that smell? It smells like something is burning!". We did a search and destroy mission. It gave me an excuse to get rid of the desktop computer hardware that I had been collecting to repair computers, some old DVD burners, and some really weird electronics that I wanted to put together to build a crystal radio with. You know, like they did in the boy scouts back in the day? I wasn't a boy scout but I could build one of those radios from memory and change the frequency from AM to Shortwave with a couple of turns on the coil, but that is a different story. The culprit was this rug. The one that I had lovingly kept safe since 1996 when it fell into my hands. Years down the road, it was still here. I moved it out to the back porch thinking it may just need to air out more. The next day it was still dry but the lanai smelled of old rug. Finally it was time for it to go. Good bye old rug. It's time for your last trip to become electricity at the Trash-to-Steam plant.